I wanted to ask about writing a spec script for an existing series that is itself an adaptation. Let’s say I want to write a spec for a TV series based on a comic book – Daredevil, Jessica Jones, Arrow, The Flash, etc – or one based on a series of novels – Hannibal, Game of Thrones, etc. What would be your advice on how to utilize the source material in the spec script? Say there’s a particular story from the source material that I’d love to adapt for one of these series – would that be fair game for a spec? Or would you recommend avoiding any use of the source material, and creating something completely original – as though the TV series existed in a vacuum? This is an interesting and complicated question that ties into several factors: faithfulness of the adaptation, faithfulness from your own spec, and originality. Is it fair game to use inspiration from the source material when you’re speccing an adapted show? A spec is in of itself an adaptation of a show (the same could be said of fan-fiction). The real issue behind the question is where “inspiration” ends, and where “plagiarism” begins. If you are using the source as only a jumping-off point, then that’s probably fair game. There’s really nothing wrong with being inspired by something. It’s all about how you use that inspiration. That’s why we also need to look at how the show you’re speccing uses its own material. Ask yourself: how closely (or not) does the series tie to its original format? Does it actively seek out to copy narrative arcs? Or does it only bear the names of characters, but without any of their attributes? Daredevil and Jessica Jones have very serialized arcs that relate to particular comic arcs and villains. The same could be said of The Walking Dead (just look at who’s coming in). On the other hand, Arrow, The Flash and Supergirl are inspired by the comics, but they really make the various DC villains and characters “their own”. Even some iconic comic elements present in the series (e.g. in Flash, characters like Zoom, Vibe, Jay Garrick, Reverse Flash) are truly infused with the personality of their TV adaptations. 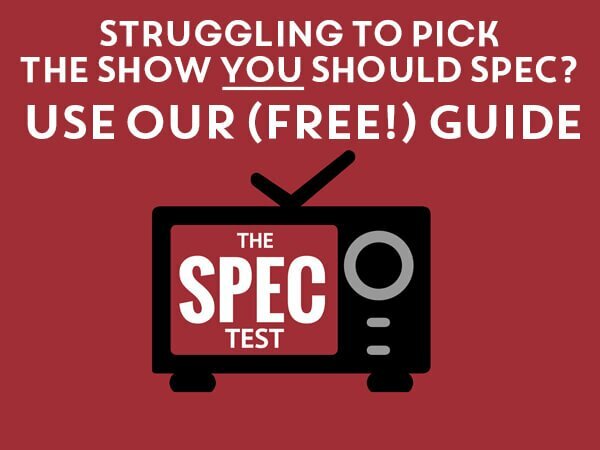 The number one “spec rule of thumb” dictates you should strive to mimic the style of the original show; meaning also its faithfulness to the original work. But if a show is too faithful to its original source, where does your own originality come in? Should you avoid using the source material altogether? I’d argue it is downright impossible to write a great spec of an adapted series AND be like Jon Snow (i.e. know nothing) about the original source. Game of Thrones has a complex mythology and populated world because of George R.R. Martin. The Walking Dead has emotional baggage behind Negan because of Robert Kirkman/Charlie Adlard. The Flash has its iconic Rogues gallery because of all the talent behind DC comics. You simply cannot bury your head in the sand and ignore the source material. Because that is not how the shows you’re trying to spec operate. If anything, you need to understand all the rules of the world, and those of its adaptation. That usually means you shouldn’t transpose a complete story arc and just add some TV dialogue on top of it. Greg Berlanti shows are notorious for first looking at their central character’s episodic conflict before even glancing at the DC roster. The writers want to nail what the characters are going to go through first, which will then dictate what villain is the best antithesis to that problem. 1) It defeats the point of a spec. As is oft-repeated, a spec is here to show you can blend in with the source, which in this case is the show not the comic/book it originated from. 2) You run the risk of the series doing a similar run of storylines down the road. And they’ll probably do it better than you could (since they know their own show better). 3) Depending on how major the story arc is, there’s a strong chance someone out there is already speccing it. 4) You risk being branded a copycat, especially if a reader is very familiar with the material and sees you copied it. Do you really want that reputation? Will you be penalized for using an existing DC Comic villain in a Flash spec? Probably not. Will you run into trouble for copying an entire issue of said DC villain? It’s a definite possibility. Since all adaptations have their own degrees of faithfulness, and people tend to imitate that same for their specs, it’s therefore not surprising that Game of Thrones (a close adaptation of its novels) is not accepted by the Warner Bros. program. How do you utilize the original source material? The answer is clear: do your research on how the show compares to the OG book or comic. Read, learn, and more importantly look at the differences. Don’t just look at the contrasts in story, or how characters are portrayed on the show, but understand why the writers decided to diverge from the books. There always are specific idiosyncrasies of adaptations; thematic ideas that they focus on over others (vis-à-vis the original). How central was Catholicism in Netflix’s Daredevil compared to some classic Daredevil comic runs? How different was Tyrion’s portrayal in the books versus a show where he’s played by a popular actor? How important is Cisco’s character journey to becoming Vibe/Reverb in the Flash comics? Once you have answered that, you’re a step closer to figuring out what makes the show “the show” and the book “the book”. If you’re drawn to a particular story, then you’ll need to find your own take of the material, all within the tone of the show. Although you may run the risk of someone using that villain in the future, if you really made that character your own, then you may still be able to use the sample. Infusing that original creation with your own personal take, and the spirit of the TV show, is ultimately what will separate stealing from adapting. If you’re a reader with a question of your own, feel free to send me a message!